It has been a wonderfully long cool Spring compared to last year. What a difference. 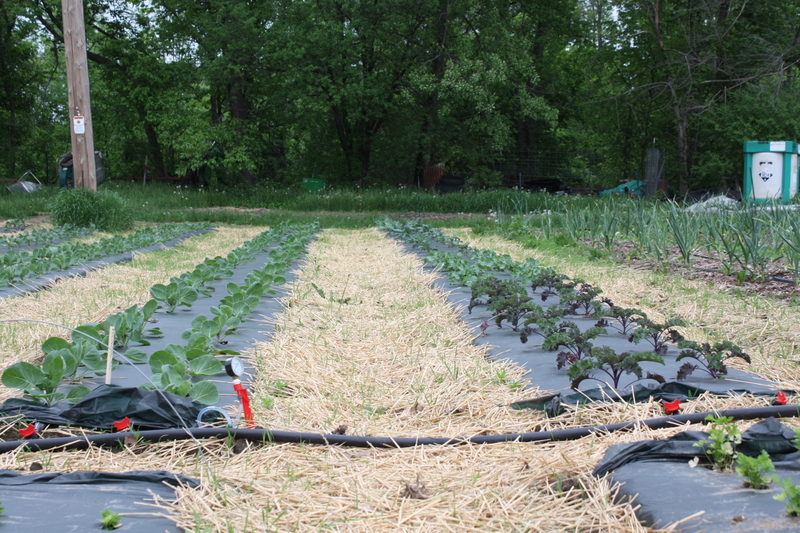 The garden progress has been chugging along at a good pace. We feel well weeded and on schedule. Every day presents some small unexpected challenge and then there is the usual Spring lament of “where are we really going to plant all this!” REALLY! 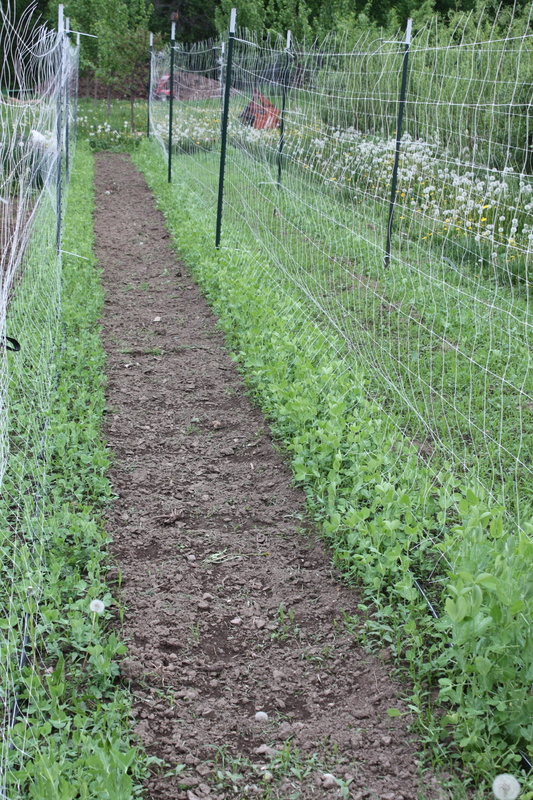 It’s difficult this time of year with short term Spring Crops like radishes and getting our rotations just right. Scott and I have very different concepts of “space” and the discussion can get pretty interesting…but, it all settles down by the end of June and our routine is set. Before the Summer CSA boxes start up and the weekly newsletters appear I thought it would be nice to take a quick peek at the garden…. The greenhouse a few weeks back. Many of the plants in the above photos are already in the garden. Hard to believe how much things change around here from week to week. 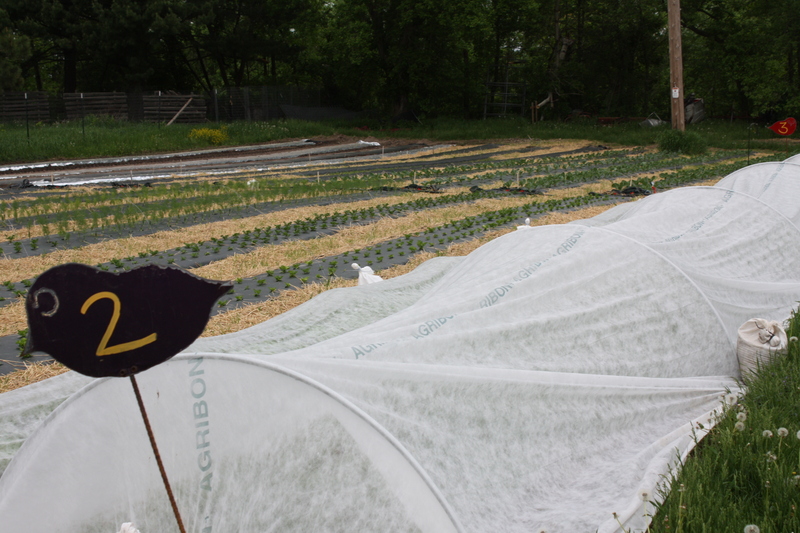 It is a constant rotation of starting new seeds and planting. 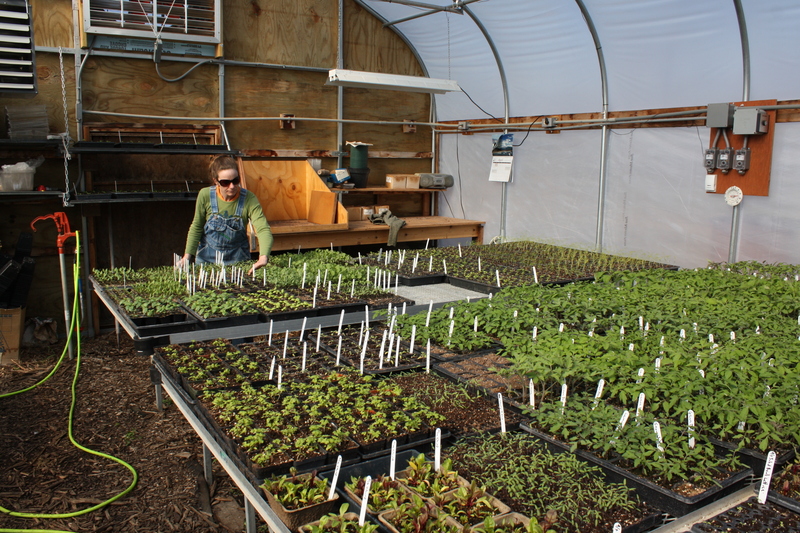 We start lettuce every other week in the greenhouse and transplant out again with each harvest. 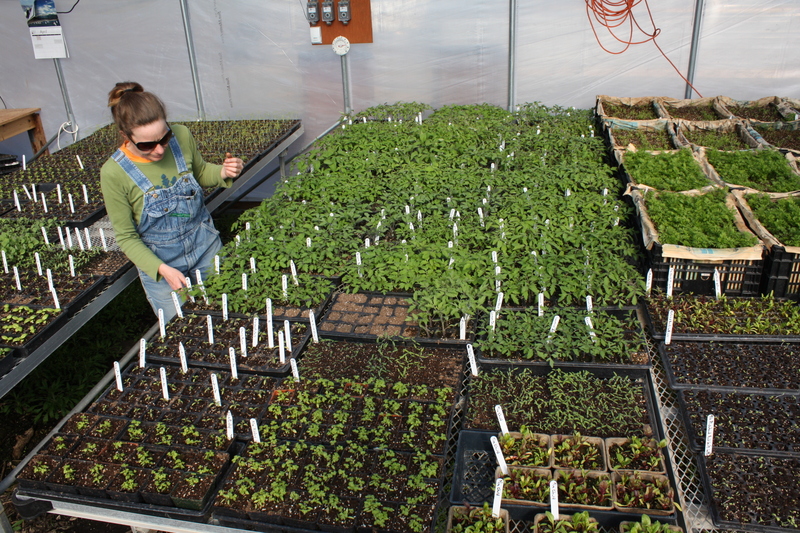 We also do several plantings of many items such as Broccoli, Cabbage, Summer Squash, Fennel, Basil, and Dill so there is always something germinating in the greenhouse. Planting the Spring Broccoli, Cabbage, and Cauliflower. 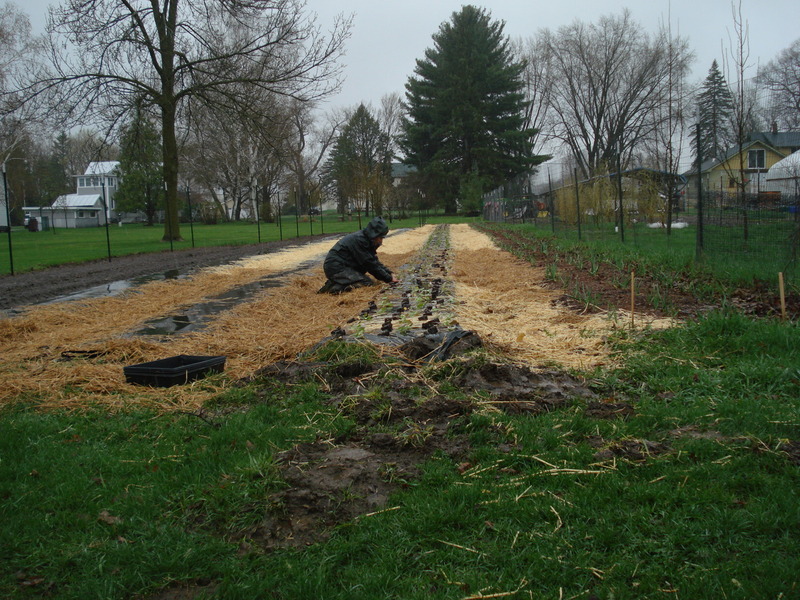 Salad Turnips under the row cover, celery, celeriac, and cutting celery next, followed by rows of fennel and all the potatoes way back there. It’s fun to take a look at the garden in the Spring and then again when we are in full swing…. 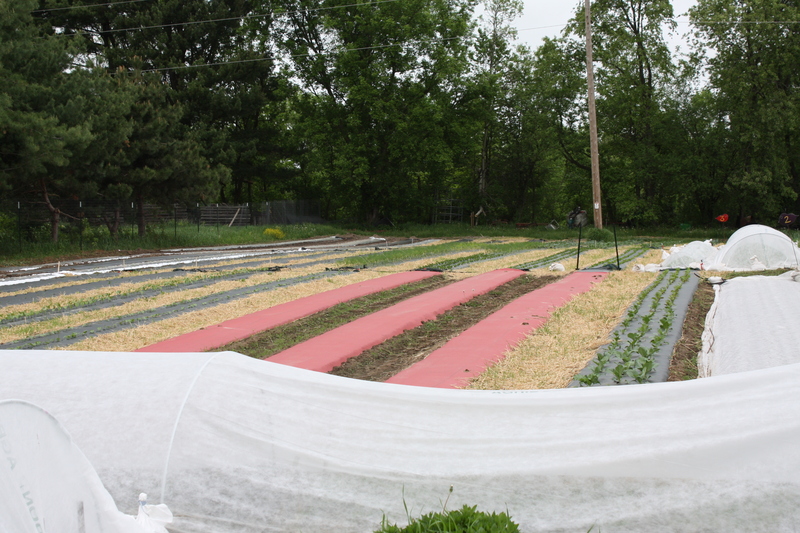 The red stripes are where the tomatoes will live this year whenever it warms up enough to plant. Green Beans just germinating to the left. All the Spring Asian Greens in the front under row cover. Beautiful brussels sprouts (that we will not eat until Fall) and Kale, and Garlic. 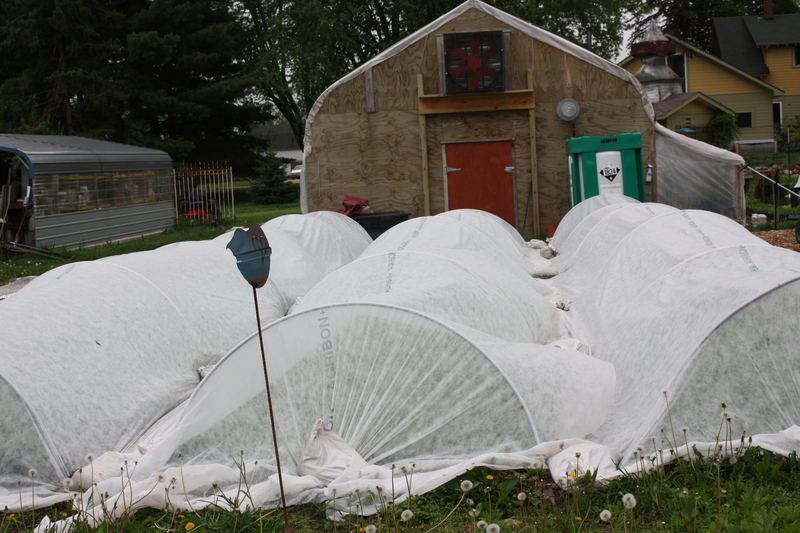 All our leafy greens we grow under row cover. Chemical Free pest management and also the leaves stay a lot cleaner this way. 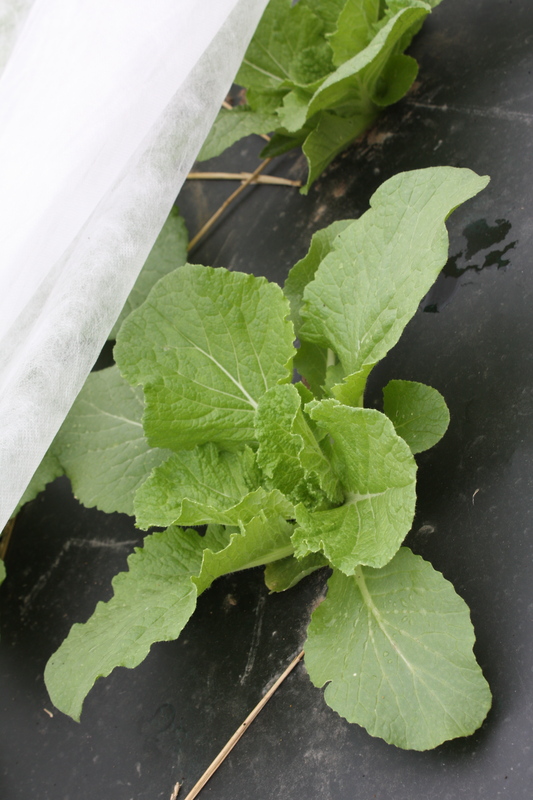 A peek at the chinese cabbage under the row cover. LO0OKSSSSS FANTASTIC…THINKING OF YOUR . HAPPY IT IS SPRING. Thanks for posting the photos. They really increase my appreciation of all the care and love you put into the business of growing healthy food for us lucky recipients! Yum!